Living as a religious Jew in Jerusalem, it’s so easy to forget that my day-to-day reality was, in fact, an impossible, unattainable dream for entire generations of Jews who for 2000 years prayed morning, afternoon, and evening to return to this holy city. Maybe that’s why I find few things more inspiring than reading about Jews, like former Prisoner of Conscience Rabbi Yosef Mendelevich, who risked their lives to live as Jews and to come to the land of Israel. 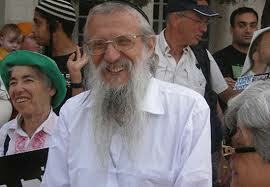 Born in Riga, Latvia in 1947, Rabbi Mendelevich joined the underground struggle for Jewish rights at the age of 16. He founded an illegal Jewish organization and was one of the first Jews in the Soviet Union to return to Jewish observance and faith. After a Soviet official replied to his request for an exit visa with the declaration, “Forget about Israel! You will rot here,” in 1970 Mendelevich, along with 15 others, attempted to hijack a plane from from the USSR to Sweden in a desperate attempt to attract the world’s attention to the plight of Soviet Jewry. While the hijacking failed, it was, in retrospect, a history-altering success….Many see that failed hijacking as one of the first dominos to fall, leading ultimately to the emigration of the vast majority of Soviet Jewry. After 12 years spent under brutal conditions in Soviet prisons, Mendelevich was released in 1981. Today Rabbi Mendelevich is a teacher at Jerusalem’s Machon Meir yeshiva and is married with seven children and many grandchildren. Rabbi Mendelevich tells his unforgettable, incredible, and very inspiring story in his newly-released autobiography Unbroken Spirit: A Heroic Story of Faith, Courage, and Survival (Gefen). 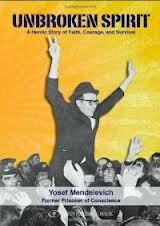 Here are some excerpts from the book about his brave determination to stand up as a Jew in the USSR. In our school, the principal would wear his military uniform, as though the war had not ended, as though we students served as little Soviet soldiers. In first grade, our teacher asked us, each in our turn, to announce our nationality. Among the forty students–Russians, Ukrainians, Latvians–I was the only Jew. The rest were Soviet children, well aware that to be Russian was the highest blessing. To be born Ukrainian was half-tragic; to be a “Chochmek,” as they derogatorily and indiscriminately called anyone with roots in Asia Minor, was worse; but nothing could equal the infamy of being Jewish. “You don’t look Jewish” – this was the highest compliment one could be paid by a Russian acquaintance. But the God-given shape of my nose and face left no doubt as to my origins. And so I waited in dread like a hunted animal for my turn to answer the “nationality” question. “Jew,” I replied, breathing with difficulty. The class giggled. Today, my adule heart pities the kid I was then, standing alone before an entire mocking class. Maybe it would have been better to lie, to remain silent, but I couldn’t possibly have denied my Jewishness. In those days very few were granted permission to emigrate to Israel, but [Aunt Fania], old and infirm, managed successfully to make the journey. Aunt Fania went on to send us letters and a postcard from Kfar Giladi- my first geographic reference point in Israel. In her letters she wrote of Tel Hai and Joseph Trumpeldor. And that colorful postcard, depicting a swimming pool, opened my first small window onto the country. I gazed through a magnifying glass at the postcard’s every tree and counted all the people it depicted, astonished to see so many Jews gathered in a single place. My imagination sought some foothold in reality, and from that day forward I knew my life would not be a chain of random actions but would be dedicated to a single purpose. We printed our first issue of Haiton [an illegal Zionist Russian-language newspaper] on a typewriter, using thin paper to make eleven copies at a time. We had purchased this paper in small quantities at different stores and at different times so as not to draw undue attention. Nor was obtaining a typewriter without difficulty. Rumor had it that the KGB could trace and track every typewriter on the market by means of a unique “letter signature” each machine had. Then, our printing was laborious, and poor in quality: typists we could trust were both expensive to hire and hard to find. Finally, the printing completed, we bound the issues and distributed them–in small numbers, of course. “I refuse to sign the protocol until you return my kippah,” I insisted. The kippah was brought to me, and I put it on at once. Until then I had been compelled to wear a handkerchief, which served as a source of amusement for them. Now the jokes stopped. they merely looked at me contemptuously, and harassed me at every opportunity. If I forget you, Jerusalem, may my right hand forget its skill.” This she said in Hebrew. Sylvia translated the verse–Psalm 137:5–into Russian. The prosecuting attorney nearly fainted from anger. What else comforts me? Reflections on the history of the Jewish people. Prayer. I have no prayer book, but I compose my own liturgy in my mind– prayers for the peace of the Jewish people, for my father, for my release from prison. Since I dont know the direction of Jerusalem, I pray facing the window, toward our Father in Heaven. I sing as the psalmist sang, “Out of the depths I cry to You, Lord” (130:1) Into this prayer I pour all of my aching, all of my love for my people, the full force of my faith. The more fervently I pray, the stronger my faith becomes, and the more fully it becomes embodied, in turn, by prayer. I feel as innocent as a child standing before his master and speaking straightforwardly, without intermediaries. We heard Rabbi Mendelevich speak last November at Beth El NSC when he visited Chicago. An unforgettable experience! Every word he writes in his book about being a Jew in FORMER Soviet Union is absolutely true. Thank you for spreading his words.